I selected the tapes for this review myself (instead of watching other people's questionable choices). I have been interested in Shoji Nishio since I read an interview with him - I particularly wanted to see his alledged integration of Muso Shinden ryu Iaido with Aikido. That is why I started with vol. 3 and 4 (shomen uchi), which seemed more likely to contain his Aikiken than vol. 1 & 2 on katatedori. Nishio sensei starts volume 3 by contrasting aikido with other martial arts he has practiced, particularly referring to judo and karate, saying that aikido is a lot more complex and sophisticated. However, for the last 10 years aikido practice in general has lost more and more of its martial aspects (mostly because practitioners get too comfortable doing the same thing). A real martial art must allow an instantaneous response to any situation. Aikido must therefore also be applicable with the ken and jo. Aikido is a budo, and based on the movements of the ken. 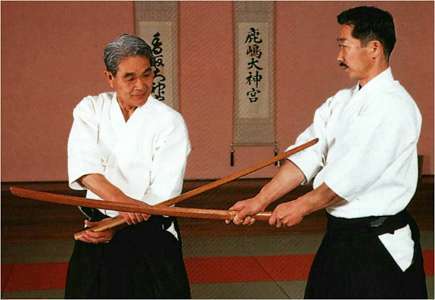 Many instructors today hardly know how to grip the sword properly, and therefore express the opinion that aikido is a purely empty-handed art. 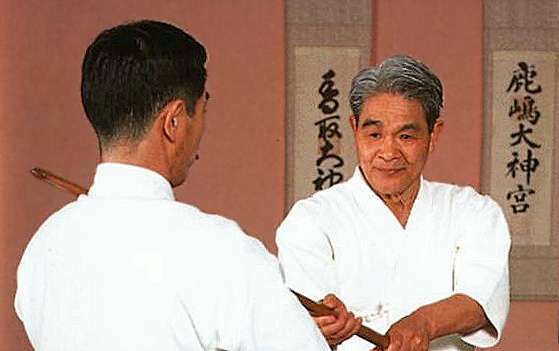 He next explains the tapes show his everyday training, which differs from how aikido is generally practiced, and invites the viewer to adopt this method in practice, or to disregard it if it is not deemed worthwhile. Then follow some warm-up exercises, with possible applications, for which the importance of atemi is stressed. The first actual technique is shionage: "our method is very different from how it is generally done." 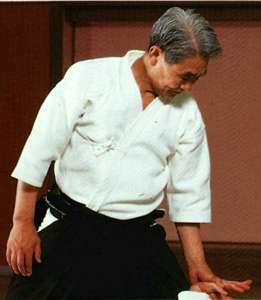 The point Nishio sensei stresses in this and following techniques, is that in aikido one does not parry but enters directly. 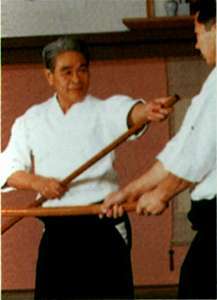 The second technique demonstrated is ikkyo omote and ura, also very different from how it used to be practiced. One usually opens, then enters, which works, but is dangerous. To be of value, a technique must always consider the possibility of more kicks and punches. Aikido must encompass all forms of budo to be authentic. Gokyo also presents many difficulties. Not only in aikido, but in all martial arts there is the tendency to try to parry the attack. Also shown are one form of irimi with applications, kote gaeshi, and finally throws as oyo waza. In this part aikido is contrasted with judo throws. Aikido throws are totally different from judo because in aikido the balance of an opponent is taken by atemi. A judo-like throw is extremely difficult to achieve in a real fight, especially against multiple opponents, which might be armed (here Nishio sensei tells an amusing anecdote about two judoka getting in a streetfight - so who was the other judoka?). Atemi is very important; if aikido consists of 60% pins and 40% throws, then all include the use of multiple atemi. Volume 4 starts with a second form of irimi, in which is explained that in aikido the hand is used like the sword, which is totally different from its use in karate (to block) - with the remark that the swords must be used correctly. The hand in irimi is absolutely not used to push back towards the opponent, it is instead used to draw out the opponent, while one enters directly. If one raises the sword at the same time as the opponent, matches his strike and then pushes the sword down, it is too late. In aikido one should enter directly (empty handed this becomes atemi). The hand is never used to protect, unlike in other martial arts. The next techniques are kotegaeshi, nikkyo, and a 3rd irimi, and 2 variations of sankyo, and finally 2 shime waza (which are actually neck breaks but for safety in practice we just do a choke - but Nishio sensei asks to keep the real meaning of the movement in mind). Each technique is also demonstrated with ken vs. ken, and with jo vs. ken. (Our first view reaction: "look, they have held a stick before" - this is actually a high compliment where aikiken is involved). There are subtle differences between the ken and jo application. Nishio sensei explains: "because a ken is used to cut, it is more effective on soft tissue, but a jo has no edge, therefore it is used more effectively against hard targets, like the jaw, the knee, the side of the head,..."
Most techniques are also demonstrated in "aikido sword" form, a sort of solo iai kata ("look, he has held a sword before, too" - actually Nishio sensei holds advanced ranks in iai, jo, and a baffling number of other arts). Nishio sensei's use of the ken and jo is fast and very subtle, I watched the tapes more than 5 times now and I'm only beginning to see a glimpse of what is going on. But this tape is typical Japanese instruction, each technique is demonstrated twice and that's it. And Nishio sensei is very fast, if he didn't explain from time to time what he is doing, you could easily miss more than half of it. One thing I'm really curious about is whether the exotic chiburi and noto moves employed in some of the "aikido sword" forms have some hidden meaning (I would guess these are just randomly picked for fun from various schools Nishio sensei has studied). I showed these tapes to my friend who collects dubious aiki-ken tapes. "See, you *can* do meaningful things with a ken or jo in aikido" He reflected for a long time, and concluded: "that can't be aikido!" It's been very long since I have so enjoyed an aikido tape. Nishio sensei's demonstrations are not fancy or spectacular, nor 'hard' or brutal. No mangling or killing of pinned opponents (with various shouts) as in certain styles, instead great attention is devoted to the most crucial but very often overlooked phase of the encounter, the time up to the initial contact.